BSBG recently completed the concept design for a new confidential luxury hotel development, incorporating the in-house disciplines of Architecture, Interior Design and Structural Engineering. The group is currently overseeing construction of the project, details of which will be featured within these pages once the hotel is officially publicised. In our new ‘Hotel Design’ series, we will uncover the various elements that must be pieced together in delivering the design of a premium hotel experience. From the point of arrival, central feature atrium, F&B offerings and guest rooms, this series aims to uncover the process and reasoning that underpins hotel design. In this first edition, we focus on the concept of a rooftop bar – a component present in many modern hotels. Senior Design Architect, Piers van Zandvliet, and Senior Interior Designer, Alia Soufan, describe the design process behind this standout feature. The typical nature of a rooftop bar, as a semi-enclosed space, requires the interior design to integrate seamlessly with the architectural elements, and vice-versa. 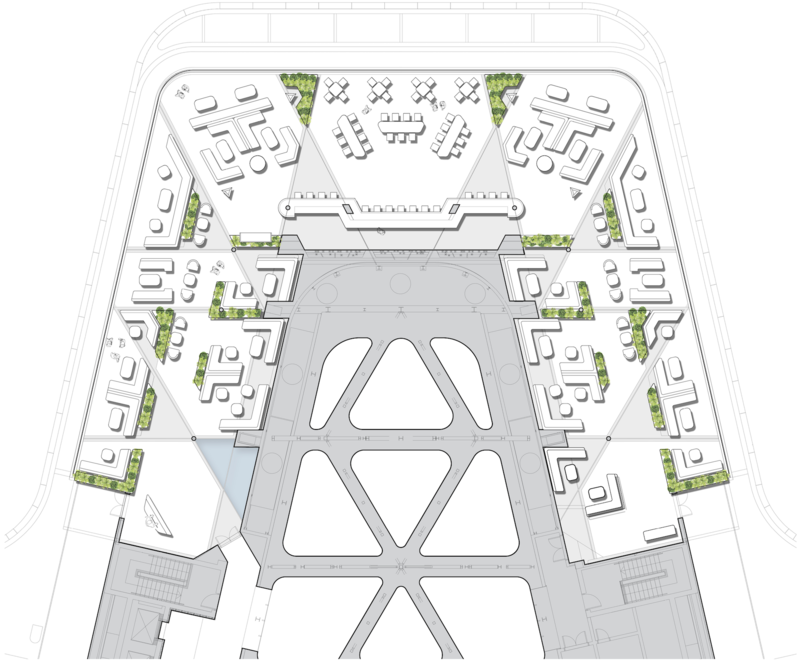 Within this project, the lettable internal area wraps and fits below the crown of the hotel; an architectural feature, the geometry of which shares an association with and influences the layout of the space. The hotel crown is a distinctive design element in itself. The form branches off the structural axis of the central feature atrium, and this provided the basis upon which the internal layout of the rooftop bar was formulated. Within the expansive central atrium of the hotel, a large Mashrabiya-styled ceiling rests behind an expressed structural frame. These components create the focal point within the atrium as guests arrive at the hotel. 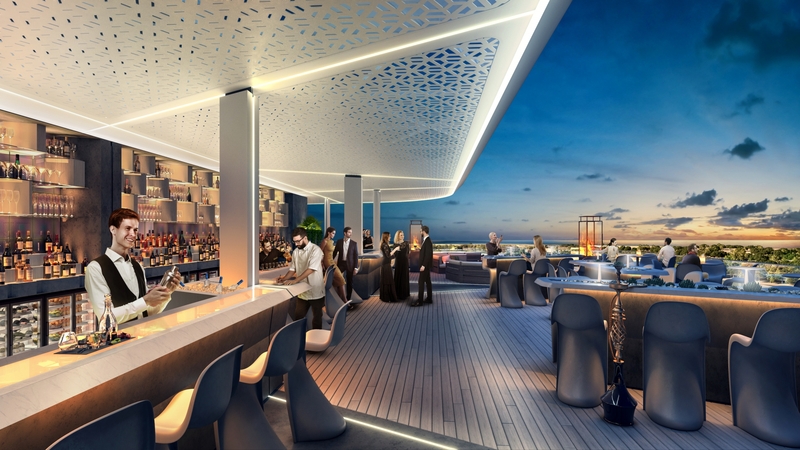 The intent of the crown is to extend that geometry and the Mashrabiya as a canopy stretching across the rooftop bar, creating an almost poetic continuity for the end user. If the introduction is guest arrival to reception within the atrium, the rooftop bar acts as an extension of the design language made apparent within that introduction; adding extra dimensions, while retaining a fluid connection to the overall design theme. Repeated exposure to this motif throughout the journey, culminates at rooftop level and represents the final act, or chapter of the design narrative that guests will experience throughout the entire hotel. As the crown and layout are primarily responsive to the architectural form and geometry, the interior selections for colours and materiality in turn respond to the surrounding natural environment. The bar overlooks an existing golf course, which presents a sprawling, green landscape in the foreground, complemented by an ocean backdrop. The hotel building is oriented in such a way so as to provide one of the most uninterrupted and spectacular views of the Dubai sunset, and this is a key feature of the end user experience at the rooftop. These fundamental environmental components are referenced by the furniture colour scheme, which features a selection of greens, oranges and yellows, while the chosen materials take on a visually raw appearance, with ash-coloured timber-effect flooring, and natural stone tiles. These colours and the selection of fabrics serve to accentuate the synchronicity and relationship between the environment and the rooftop bar. There are perhaps no words that highlight this connection better than the visual explanation itself. The guest arrival elevator is deliberately situated within the west wing. As the elevator doors open into the entrance lobby, the end user is granted a view of the central atrium space from above, after which they will experience the full sensation of the sunset while moving through towards the bar. The layout is definitively modular, and is populated with a flexible selection of ambulant furniture. The layout can be customised to reflect the capacity requirements at various points during operations. In terms of furniture, such as tables and loungers, a low profile approach has been adopted, ensuring that uninterrupted views of the beautiful landscape and sunset are available for all. From a structural perspective, the structural engineering teams at BSBG worked to reduce the number of columns upon which the Mashrabiya crown rests. This was a highly technical exercise, and had to be resolved before pursuing the interior design intent. Use of light within the rooftop bar is paramount to the impact of two key features: the crown and the bar area itself. The Mashrabiya canopy is pure white in colour, and is illuminated from underneath to give the appearance of hovering above the space it covers. The primary lighting features are part of the crown, and light works its way down from the canopy, channelling in to the flooring – further reinforcing the geometric concept that drives the design. Maintaining the elegance of the design having incorporated the necessary functional components can be one of the greatest challenges for an architect and interior designer in a project such as this. BSBG strives to ensure its concept design prevails, taking the lead in co-ordination through all project stages, providing clear direction for the consultants and a strong methodology they can follow, focused on preserving our design intent and retaining the aesthetic quality. The end result is an evocative and attractive proposal, which meets the BSBG standard of architecture and client expectations, with aspirations of providing a unique and memorable experience for the hotel guests. *BSBG developed the concept design of this hotel from an existing vision document commissioned by the client from an external design consultant.